I went into work and got surprised with a double shift. Um thanks...I didn't pack a lunch. So there went the calorie count for the day. I did get really great work news! I'm being sent to Pittsburgh for some training. Yay!!! I'll get 4 days of a vacation...well technically 2 because I'll be in training for the others. What will I be doing when I'm not training? Shopping! And surprise, I'll be leaving week after next. Here's to hoping my room has free internet! Maybe you can help me figure this out... Why, oh why are old people so afraid to pass semi's and tractor trailers on the highways? I mean really? If you're going to drive in the left lane then guess what..you need to punch it. If you're going to be a snail move it over and get behind or in front of that 18 wheeler. I will ride your bumper until you move! On a random note, I really wish I still had my "skip it" toy from when I was a kid. That thing was a major work out and it kept track of how many turns you did! Thank goodness indeed! Whew! Glad all is well. Skip It was one of the best things around. I haven't thought about that is forever! Thanks for the thought. Happy Friday! 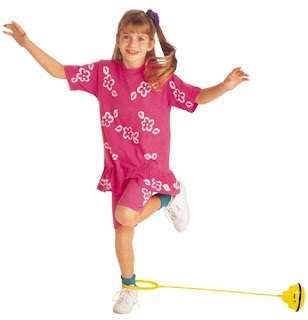 Oh my goodness...I totally forgot about the Skip It! I had one in pink. So glad to hear that Matt is okay! Glad you heard from him and that he's ok! I loved the Skip It, too! See no news really is good news! Enjoy your shopping in Pittsburgh! Oh I used to rock the Skip It - loved that thing! Man, I loved my skip it. They should make one for adults now... it was fun. ahhh this take me back!! i used to have skip it competitions in grammar school... love it!! I had a purple skip it and it was my pride and joy from 3rd-5th grade. It was amazing and I loved it so very much. I'm so glad you reminded me of my beloved Skip It! I forgot all about the Skip Its! Ok, somehow I missed that Matt was MIA! YIKES!! I know you feel better!! Damn deployments!! Damn them all! UGH!! Have a blast in Pittsburg! So glad you heard from him. And that Skip it does look like a really cool work out! Glad you were able to hear from Matt! I LOVED my Skip it when I was younger too. I bet you could find one of those at a thrift store. I LOVED MY SKIP IT! I had a pink one and it was amazing! And I hate old people who drive, they shouldn't be allowed on the road! Have fun! I LOVED my skip it! yea for chatting with hubby! I had a lemon drop as a kid...same thing as a skip it. I can still hear the sound of it whipping around my foot!!! excellent point about the skip it. I had one of those growing up and killer thighs. sigh. those were the days. enjoy your getaway to the burgh! I'm a little behind.....Glad you know Matt is ok!!! And who doesn't love a few days away. Yay for spur of the moment trips. Glad to hear the good news! And I had a pink skip-it...oh I loved that thing! Congrats on the semi vacation! Have a great time! Pittsburg huh? Let me know how that goes. At the very least you're getting out of town and a change in scenary is always good. Glad all is well and my YMCA has the skip its... I tried them yesterday and fell on my face... not as easy as I remember! Im glad that you heard from him and everything is okie. Oh my gosh, skip it! I totally forgot about that toy! Man that would be a totally good workout!! I havent seen this thing in ages. Great laugh this am. I still have my skip it, so be jealous :) Im glad you finally heard from him, and you trip (while for work) sounds like it will be fun! OMG! I had one of these when I was younger but mine had a ruby marbled kinda ball on the end. I could never, EVER work out how to actually do it!!! So glad you heard from him! You must be so relieved! Thank goodness you talked to him! !